Holy crud it's June! And I am SOOO not in swimsuit shape. Time to start panicking and start some crazy celery and beef jerky diet? Nah...but some lighter fare won't hurt. Combine first 7 ingredients in a Dutch oven; bring to a boil. Reduce heat, and simmer 10 minutes or until sauce thickens, stirring occasionally. Combine chopped fresh parsley and the next 6 ingredients (through ground turkey breast) in a large bowl; shape mixture into golf-ball sized balls. Place meatballs on top of onion mixture; cover and cook for 20 minutes or until done. Sprinkle evenly with slivered almonds. Combine all ingredients; store in an airtight container. 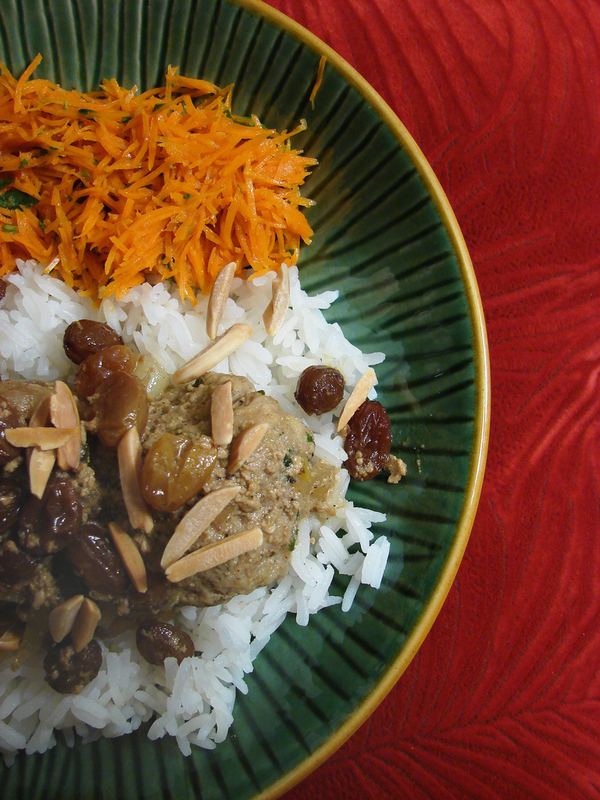 This was a tasty for the most part, although the turkey balls will need tweaking. They were a bit dry, and could use more flavor...It's ground turkey, people...it needs more help! I'm wondering if using the gelatin trick from Cook's Illustrated meatloaf recipe (the recipe I use for meatloaf cupcakes) would help keep these moist? Like I said...needs tweaking, but this recipe has potential. 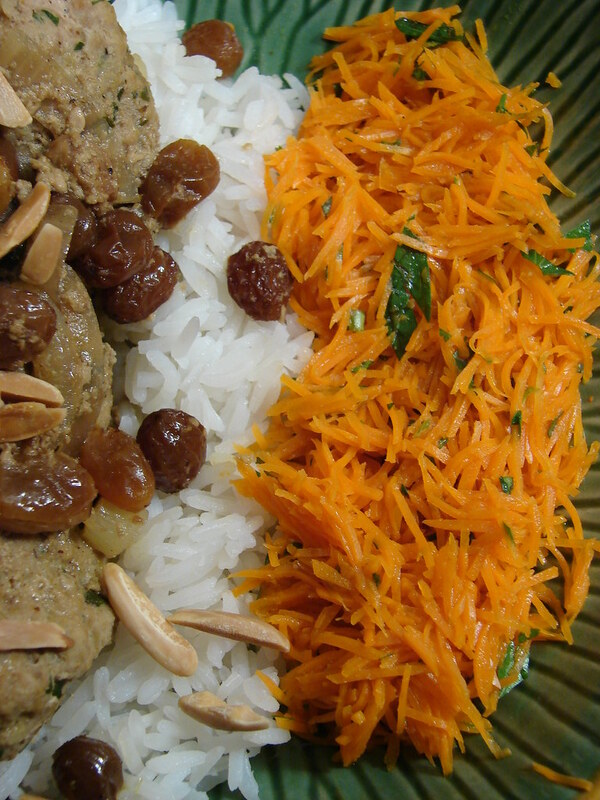 The flavor of the raisin and onion sauce and the Ras El Hanout was wonderful over Jasmine rice. This salad will most def. make more appearances this summer. So...dare i say it...simple...and so yummy! I like the shredded texture, too. It was so...scoopable! and marinating it for an hour was certainly sufficient that way, too! So Moroccan meals = roccin' body? Perhaps not quite...but it doesn't hurt. Now to get hooked on running, push-ups and crunches...then maybe the turkey balls will make a difference.